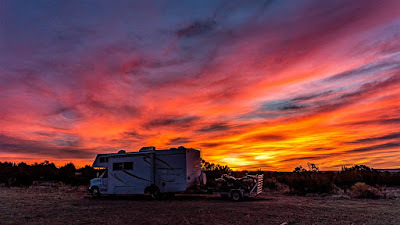 A Redleg's Rides: Boondocking Sunrise and a Mechanical Failure that turned out to be not too bad. 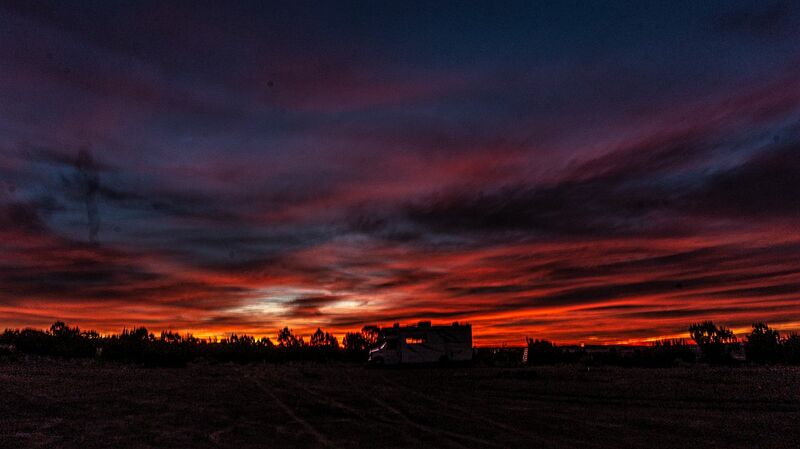 Boondocking Sunrise and a Mechanical Failure that turned out to be not too bad. Woke earlier than the alarm, and was having my first sip of coffee when I glanced out the window and saw the beginnings of a great red sunrise. I left the Penrose BLM site at a bit past Noon after having found and checked out the next spot I'll use when I return, soon. It's much more secluded and away from the ATV traffic than the site I used this past week. I rode Scarlett, my 2014 Patrol over to Westminster for a couple of appointments with a VA Veteran's Administration medical contractors. Having my hearing confirmed as bad and check of the right ankle. On the way there, Scarlett started making rattling noises when I would let off on the throttle to slow down in traffic or shift down gears. Oh Oh. Lots of scenarios ran through my head: such as something inside the gearbox (which had been rebuilt by the legendary Sergei of Ural HQ over two years ago), or the clutch plate splines were starting to shear away, or after talking to Randy the Ural dealer in Loveland, CO; the bearings on the alternator coupling were going. I got through the appointments with no issues and headed on home, hoping to make it there without a breakdown and having to be towed on a day when snow was expected! The rattling noises would come on deceleration and shifting gears, getting more often and louder as the ride progressed. Two blocks from the house, it became almost a constant rattling noise (similar to when you hard brake using rear brakes on loose soil when coming down a mountain trail). But, she got me home! After a late lunch and calming of the nerves, I steeled myself to go out and uncouple the gearbox from the engine case to examine the damage to what I now thought was failed clutch plate splines. I was doing a closer look at the drive train and notice some unusual movement at the main driveshaft's u-joint. Getting a flash light I saw that the u-joint had broken off along one axis! No idea how it managed to stay in there and keep the two halves of the drive shaft coupled together to drive the final drive and get me home! The u-joint caps are still in place! impacted the final drive fork. Randy, my Ural dealer in Loveland, CO had the part on hand fortunately (it's a Russian U-Joint, apparently not available here through regular auto parts store outlets). He'll send it to me soonest, only $18 instead of what I was projecting in terms of if I was lucky, replacing clutch plates and if I was unlucky, having to repair a gearbox! I hope to have Scarlett back on the road by the weekend Monday next week, the dealer forgot to mail it out and since I'm headed his way for camping.....I'll pick up the part from him instead. Note: This particular u-joint lasted well over 58,000 km. I guess you need to stop smoking the tires when drag racing the Ural. Thanks, Anonymous, almost marked your comment as SPAM. Any way preventive maintenance could have saved the joint? (Trying to do the math...), 58K still seems like an early failure. Greybeard, I would grease all the u-joints (including this one with a special needle) every 2500km or basically at each engine oil change. One guy on FB said he did it ever 500 km which seems excessive to me and he was complaining the u-joints were already "going south" on him after 8500 km.